Loudoun Valley senior Drew Hunter broke the national high school record for the indoor and outdoor 3,000 meters Jan. 30, running 7.59.325 at the Camel City Elite Races in Winston-Salem, N.C. The performance was a 5-second improvement over the previous mark on 8:05.46, set three years ago by Hunter’s future University of Oregon teammate Edward Cheserek. Hunter was named Gatorade’s male cross country runner of the year. 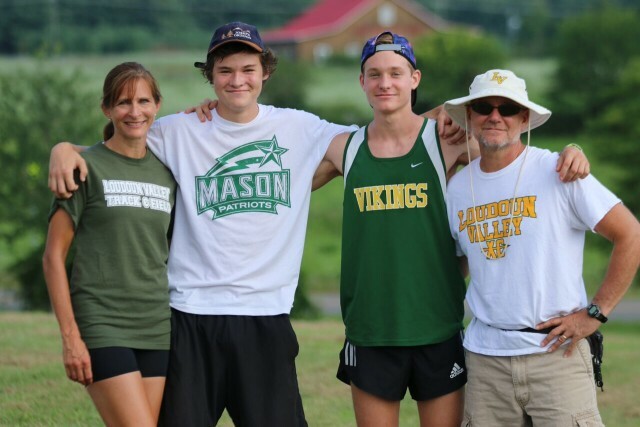 Hunter’s parents, Joan and Marc, were the U.S. Track and Field and Cross Country Coaches Association’s coaches of the year for Virginia boys’ cross country teams. The Vikings won the the 4A title at the state championships in November. At Georgetown Day School, Anthony Belber was USATFCCCA’s Washington, D.C. girls’ team coach of the year and Tristan Colaizzi was Gatorade’s male cross country runner of the year. The Mighty Hoppers won the D.C. state and Maryland-D.C. Private School championships. Gonzaga’s John Ausema is the USATFCCCA boys’ coach of the year for D.C. and Sidwell Friends School senior Taylor Knibb, D.C. state and Maryland-D.C. Private School champion, is the Gatorade D.C. girl cross country runner of the year. Heritage’s Weini Kelati was Virginia’s Gatorade runner of the year. Lake Braddock junior Kate Murphy broke the Virginia records for the indoor mile and 1,600 meters at the Camel City Elite Races, running 4:43.97, ahead of Fauquier’s Sarah Bowman’s 4:46.79 from 2005. Along the way, she ran 4:42.22 for 1,600 meters, breaking West Springfield’s Caroline Alcorta‘s state record of 4:44.40. Sherwood coach Dan Reeks was named National Federation of State High School Coaches Association Mideast Sectional Coach of the Year. The Mideast section includes Delaware, Kentucky, Maryland, Ohio, Pennsylvania, Virginia, West Virginia, and the District of Columbia.